Use a vegetable peeler to shave curls off a block of hard cheeses, like Parmigiano-Reggiano or Pecorino Romano cheese. To roll out pizza dough: When you're ready to get your pizzas on the grill, turn the dough out onto a lightly floured surface. Dust the top with flour; dimple with your fingertips to shape into a thick, flattened circle—don't worry if it's not perfectly symmetrical. Then use a rolling pin to roll into a circle about 14 inches in diameter. Pizza on a charcoal grill: Light 6 quarts (about 1 large chimney starter full) of charcoal and burn until the coals are mostly white, about 20 minutes. Spread the coals in an even layer. Place a grate over the coals. Let the coals burn until they are about medium-low. (Grill any toppings for the pizza while the coals are burning down.) To test the heat, hold your palm about 5 inches above the grill rack; if you can hold it there for about 8 seconds before you need to move it away, the fire is medium-low. Transfer the crust to the grill rack, cover the grill and cook the crust, checking once or twice, until lightly browned, 3 to 4 minutes. 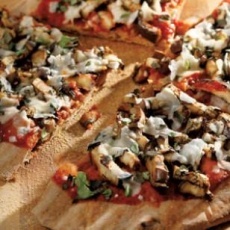 Flip the crust, quickly add the toppings, cover the grill and cook until the toppings are hot and the bottom of the crust has browned, 5 to 8 minutes. If your crust browns faster than your toppings are cooking, slide a baking sheet under the pizza to keep the crust from burning while the toppings finish. Cut eggplant into 1/2-inch thick rounds. Grill, turning once, until marked and softened, 4 to 6 minutes. Let cool slightly, then thinly slice into strips. Reduce heat to low. Using a large spatula, flip the crust. Spread marinara sauce on the crust, leaving a 1-inch border. Quickly top with the eggplant, basil and garlic. Lay the Parmigiano-Reggiano shavings on top.